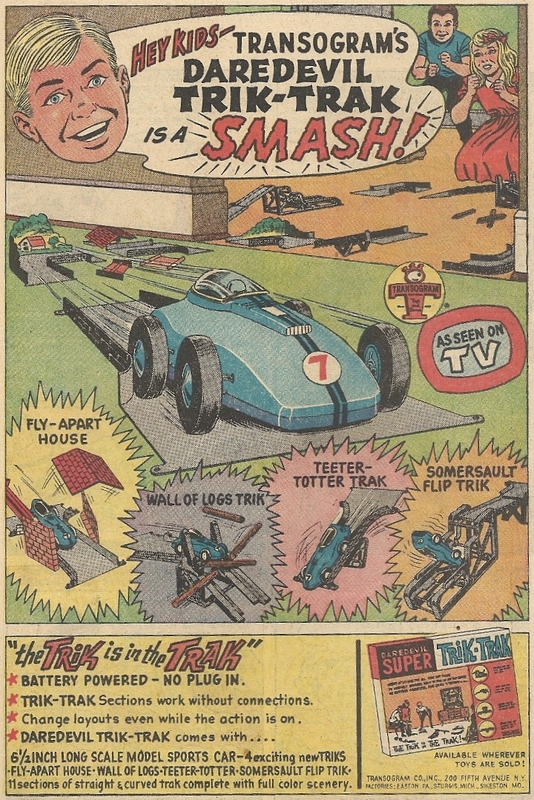 Terrify your little sister with the Daredevil Trik-Trak! The girl in the upper right-hand corner doesn’t look happy. She looks terrified, less rooting the tiny electric car on than fretting over its imminent destruction, aghast that the hellish Trik-Trak, with its logs and houses and somersaults (who’s driving, the Elwood Blues? ), will be its ultimate doom. It almost beats throwing a shed snake skin on her. No sign of her in the old TV commercial, though a Phil Silvers-ish man in a cardigan does make an appearance.